Ecolutions Recycled Pencils are made with 76 percent plastic originally used in other manufacturing processes outside of BIC. One reliable Ecolutions pencil equates to two and a half woodcase pencils. Each pencil contains three full-length No. 2 leads. Smooth writing lead does not smudge, erasing cleanly. Lead advances quickly and easily. Nonrefillable. Recycled Comments: Contains 76% total recycled content. 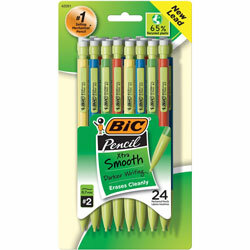 Pencils from Bic! 1317 In Stock today.